Absinthe continues to be a mystifying spirit, partly because of its scandalous history and the controversy surrounding its supposedly hallucinogenic properties. Allegedly it was created as a medicinal elixir in the early 1790’s by Dr. Pierre Ordinaire. It gained popularity after it was given to French troops to combat malaria. When they returned they brought it back to cafes, bars, and other establishments and its popularity exploded. Driven by the prohibition and temperance movement, absinthe was demonized and associated with violent crime, ultimately leading to its ban in 1912 by the US Dept. of Agriculture. After 95 years, the ban was ultimately lifted, and the genuine absinthe was once again reauthorized for sale in the United States. Lucid became the first genuine absinthe made with real Grande Wormwood (Artemisia absinthium). Lucid was developed in France by absinthe historian and distiller T.A. Breaux. It is distilled in the historic Combier Distellery in Saumur, in France’s Loire Valley. For the taste test I sampled it as it is traditionally prepared. The aroma is powerful and enticing, with aromas of anise, indeterminate spices, a hint of mint and other herbs filling the air around the glass. The taste is more subdued than the aroma would lead you to believe. The flavors of anise and fennel are the first to engulf your mouth. This is followed by notes of various herbs which are impossible to discern as they blend together in one herby and earthy flavor. Lucid is available in 750 mL for $59.99 and 375 mL for $34.99. I now offer some additional ways to enjoy absinthe besides the traditional method. First up is the Asbinthe Frappe which is an easy method used to turn the classic drip method into a refreshing iced drink. Build first 2 ingredients over crushed ice and top with club soda. Give a quick stir to incorporate. This drink slowly changes over time as the ice melts adding more dilution to the drink. It starts off strong and cold before mellowing into a sweet and bubbly drink, perfect for those warm nights. Shake and strain with crushed ice and pour unstrained into a highball glass. The egg white and cream give the drink a frothy milkshake like texture. The orgeat adds a sweet nutty flavor helping to round out the flavor of absinthe. 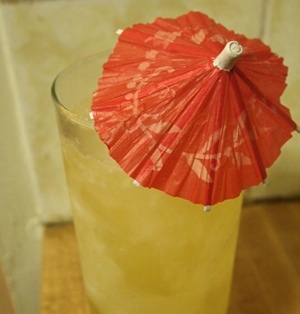 This upcoming drink is a wonderful introduction into the world of tiki drinks. Blend all ingredients together for 5 seconds then pour unstrained into a low ball glass. Top with more crushed ice. Garnish with a cherry. I decided to use Cruzan rum instead of the light Puerto Rican Rum called for. Like most good tiki drinks, this drink is more than the sum of it’s parts. Nevertheless the bitters and the absinthe are noticeable in the background lending subtle spicy and herbal notes. It is an expertly balanced drink with the sweetness in wonderful harmony with bite of the citrus and ginger. The last cocktail is a creation by Stew Ellington. The original recipe does not call for the additional .25 oz of simple syrup but I felt that the drink needed because it was a little to tart for my taste. The absinthe adds a herbal depth with the maraschino adding a touch of it’s characteristic funk. Disclosure: This was a sample bottle that was shipped to me. Nice article and a good selection of cocktails. One correction though. Dr. Ordinaire was selling absinthe at least in 1792, if not earlier. Dubied bought the recipe in 1797 and opened the first absinthe distillery with his son and H.L. Pernod. By your date of 1890 absinthe had already been around for quite a while. Thanks for the info. I had that in my notes but typed the wrong date.